Lochsong, who twice won the Prix de l'Abbaye, has died at the age of 26. Trained by Ian Balding and ridden by Frankie Dettori, the sprinter won the Longchamp showpiece in 1993 and 1994. Lochsong was British racing's last great home-grown sprinter, gaining a huge public following. 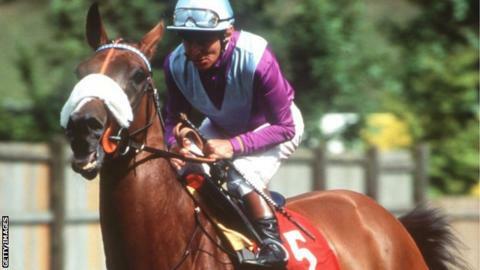 Working her way 'up through the ranks', she burst onto the scene with success in the big sprint handicaps of July to September 1992 at Glorious Goodwood (Stewards Cup), Doncaster (Portland Handicap) and in the Ayr Gold Cup. From there, a trademark front-running style, ears pricked and with distinctive noseband, saw the mare power from strength to strength, enthralling a new generation of racing fans in the process. The Jeff Smith-owned filly also won the Nunthorpe and was the first horse to win the sprint handicap treble of the Portland at Doncaster, the Stewards' Cup at Goodwood and the Ayr Gold Cup. David Bowe, of Smith's Littleton Stud, said: "She was great to have about the place and was a fantastic racemare." He added: "Hopefully we will have some of her progeny back here. "Her last foal, Swan Song, is in training with Andrew Balding and we look forward to seeing him here one day." Lochsong also played her part in establishing Dettori - prompting one of his earliest colourful lines. After the Nunthorpe Stakes victory at York in 1993, he said: "She's like Linford Christie - without the lunchbox."